We’d love your help. Let us know what’s wrong with this preview of Behind Picket Fences by Hend Hegazi. 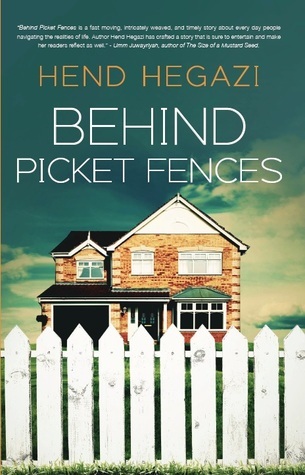 To ask other readers questions about Behind Picket Fences, please sign up. Behind Picket Fences is the second novel of Hend Hegazi, an Egyptian-American Muslim writer who lives in Alexandria, Egypt with her husband and four children. Her second novel just like the first one is nothing short than a masterpiece masha’Allah. It follows the lives of four suburban American families; one of which is Muslim. Compared to her first one, Normal Calm, Behind Picket Fences is more of a mainstream novel. So we have Sidra and Farris, Mariam and Morgan, Summer and Porter and May and H Behind Picket Fences is the second novel of Hend Hegazi, an Egyptian-American Muslim writer who lives in Alexandria, Egypt with her husband and four children. Her second novel just like the first one is nothing short than a masterpiece masha’Allah. It follows the lives of four suburban American families; one of which is Muslim. Compared to her first one, Normal Calm, Behind Picket Fences is more of a mainstream novel. So we have Sidra and Farris, Mariam and Morgan, Summer and Porter and May and Hasan. Sidra and Farris are successful. She’s a case worker and her knight in shining armor is a lawyer. She just yearns for one thing that money can’t buy. Mariam is a stay home mother and this is about to change when Morgan starts having financial troubles to support her and their four beautiful children. Summer is a vibrant young woman who is the prized possession of Porter; a semi-uptight successful Business man. Finally, May is a mother of two who is dreaming to go back to her guaranteed editing job while she is trying to get over a little malaise so she thought. The book stirred many emotions in me. When I first read it, I was pregnant so I attributed my feelings to my hormonal stage and brushed it aside. But it was to my surprise that when I read it again for a review, I was an even bigger emotional mess. I really enjoyed the story as it makes us realize that we should count our blessings and stop wishing for what other have behind their picket fences. Every blessed family in our eyes is facing a struggle we have no idea of because Allah never gives everything to His creations. Hegazi captured very well the weaknesses of human nature in her second novel and hats off to her for crafting and writing so beautifully masha’Allah. I wish her all the success she deserves with this book. Amiin. Looking forward for her third novel. I know! I don’t even know if she has started penning one but I’ll be in line to read it if I live to see insha’Allah. The book ends realistically and I’m curious to know what’s next for at least two members of these two families; Hasan + May and Morgan + Mariam. Will their paths meet somehow in the future? I wonder! What a refreshing read! I truly enjoyed the friendship dynamics of this book and the smoothness of how Islamic principles were threaded throughout the story. My favorite chapter was the one called Mothers and Daughters, I was moved by how May handled her daughter's dilemma, beautiful! There were twists that I didn't expect and the characters were varied and endearing. I would enjoy a sequel if there's one in the works! I want to know what happens with Sidra and Farris and Porter and Summer espec What a refreshing read! I truly enjoyed the friendship dynamics of this book and the smoothness of how Islamic principles were threaded throughout the story. My favorite chapter was the one called Mothers and Daughters, I was moved by how May handled her daughter's dilemma, beautiful! There were twists that I didn't expect and the characters were varied and endearing. I would enjoy a sequel if there's one in the works! I want to know what happens with Sidra and Farris and Porter and Summer especially. And I would like to learn more of the back stories behind the characters if there is a part two :-) Loved it! The book is filled with real, painful issued which affect people every day, Muslim or otherwise, and it is beautifully demonstrated as such in this novel. The story revolves around the lives of four neighbouring families, all fighting their own personal battles behind closed doors. The four parts to the story is then exquisitely interwoven as the four households begin seeing more of each other, and, to an extent, share in one another’s pain, as they do one another’s joy as well. One thing I absolu The book is filled with real, painful issued which affect people every day, Muslim or otherwise, and it is beautifully demonstrated as such in this novel. The story revolves around the lives of four neighbouring families, all fighting their own personal battles behind closed doors. One thing I absolutely adored about the one Muslim family featured in the book, is that they were so firm on their faith, but were completely non-judgemental, and very supportive of their non-Muslim neighbours, which is an excellent example of the way Muslims are supposed to be. Love being able to escape from my reality to another. This book takes you through four families and what they deal with. This is a fantastic book that's well thought out and very well written! Each page will diffidently have you glued wanting more and needing to know what will happen next. Highly recommend! It took me a long time to finish reading this book, not because I didn't like it, but because I had to stop reading so many times to think, to ponder, and to consider all perspectives. This was a true exercise in empathy. I loved and hated the characters. I became angry, I cried. Definitely not an easy-breezy, can't-put-it-down, summer beach read for me. It was too contemplative for that. Couldn't be absorbed in a few days. To me, good writing elicits strong emotions, and this book did that. The story is well written and carried forward in a systematic manner so it never got confusing. I always have a hard time remembering the character’s names but Hend Hegazi proved me wrong this time with her writing style. At the end of the novel I wished there was more to read about Summer and Porter. But overall it is a good read and one must add it to their reading list. It was simple to read. Mariam and Morgan are living in the smallest house of their Street. Mariam decided to be a stay-at-home-mom for their four children. Unfortunately Morgan's income is not enough to cover the expenses. This forces Mariam to go back to work. She isn't happy with the decision, but is willing to put her own wishes aside for the benefit of the family. Morgan is a proud man and he's struggling with the fact that he can't provide for his family on his own. These financial problems could be the beginning of the end of their marriage. Summer and Porter are happily married. Summer is an artist and Porter helped her to get into a routine that works. Porter has his own business and is a person who loves structure. He thinks that showing Summer how she can create more efficiently is the best way to tell her how much he appreciates her. Summer has the idea he isn't interested in her artwork and that makes her feel alone. The fact that she has a mental illness is making things even worse. When both of them are not filling each others needs happily ever after may turn out differently than they initially expected. May and Hasan have an old-fashioned household. May is a stay-at-home-mom who takes care of their two children. May was incredibly successful at the job she had before she became a mother and has the outstanding offer to come back whenever she's ready. When May is not feeling well Hasan is taking over the care of their children. He will do anything to make May comfortable. After several medical examinations it turns out that May is even more ill than they thought. Taking on this, possible deadly, disease together will prove how much May and Hasan love each other. On the outside Sidra and Farris must have the most perfect life imaginable. They are both successful at work and have enough money to live a comfortable life. They have the biggest house, the most expensive cars and their interior looks so good it could be featured in a magazine. Sidra and Farris are really happy together, but when their most desired wish stays unfulfilled Sidra starts to shut herself off. She doesn't know how to cope with the sadness and pain. Farris tries everything he can think of to get Sidra to let him back in, but what if he's already too late? Behind Picket Fences is a realistic and honest story about four family's who live in the same street. My grandmother used to say: you're only seeing the outside, so don't judge people until you know what's happening on the inside. I kept this in mind while I was reading and she's so right. Hend Hegazi changed the way I look at my neighbors. When I see them now I find myself thinking about what their life could be like behind closed doors. The reality might very well be completely different from the image I have as a result of what they are showing me. Behind Picket Fences captivated me. All of the characters felt so real and even though what they are struggling with is difficult the story never became too heavy for me. These people could literally live in my street, which makes the story come fantastically close. Hend Hegazi's writing is amazing and I fell in love with her story straight away. In Sahih Muslim, the Prophet salAllahu alayhi wa sallam has said regarding a true believer: "He should do good to the neighbour." This book greatly revolves around this hadith. At times of happiness, and at times of adversity, the neighbours are there for each other and look out for one another, despite being casual neighbours and not the best of friends. Although there are few minor typos, they do not undervalue the plot in any form. The author could have had a better way of transitioning the scenes, as it felt like they changed suddenly at times. The cliff-hangers at the end of the chapters prove true to its term. Each chapter leaves you hanging in the air and hungry for more, thus gluing you to the book until late at night. Don't be surprised if you catch yourself worried about the characters even while you are away from the book. I can guarantee this book will touch its readers on a deep level, and leave them with some valuable lessons. A great read! I like the author Hend's style of writing and how she finds a way to make the characters relatable on some level to the readers. We all have gone through something in our lives and like most people we do not wear our issues on our sleeves for the world to know. I like how this book shows that everyone is battling something that we may not know nor understand. I enjoy this book and highly recommend it. This was a good story, but I didn't realize it was so religious. Every other page was 'God this', and 'God that', and 'Praise be to God'...blah, blah, blah. There's nothing wrong with that if that's your thing, but nowhere in the book synopsis does this say anything about God and religion. If you don't like reading about that sort of thing, you'll definitely want to skip this as you'll be beaten over the head with it throughout the entire book. The characters weren't bad...a little 2 d 3.5 Stars.. The characters weren't bad...a little 2 dimensional and sometimes ridiculous, but not terrible. I kept thinking how so many of these issues could have been solved by simply TALKING to one another. Sidra and Farris could have avoided so much pain if Sidra had just talked to her husband instead of putting into motion her cruel and ridiculous plan. Mariam and Morgan were a different story. Morgan was just a selfish jerk. I was happy with the conclusion of their story, but Summer and Porter? Same thing...TALK TO EACH OTHER. Behind Picket Fences is a story which revolves around 4 couples who live on street in. Right off the bat we are introduced to the characters when they are all going through a turmoil in their lives. I really liked the fact that the story developed from the word go. We are given a short insight to each couple in every chapter, while the stories are not entwined there was a thread of familiarity between all. Even though there is not jus one main protagonist, Hend does a superb job of given us a ba Behind Picket Fences is a story which revolves around 4 couples who live on street in. Right off the bat we are introduced to the characters when they are all going through a turmoil in their lives. I really liked the fact that the story developed from the word go. We are given a short insight to each couple in every chapter, while the stories are not entwined there was a thread of familiarity between all. Even though there is not jus one main protagonist, Hend does a superb job of given us a balanced perspective of each story without it being left feeling like she skimped on any characters. The characters are believable and realistic and their lives could be anyone of our lives. This is a simple story but gives an amazing perspective on relationships in a marriage. I would recommend this book to everyone. I look forward to reading more of her work in the future. In the meanwhile, read this book! I received this book in a Goodreads giveaway. Things I liked: the Arabic glossary in the back and the dynamics and interactions between the neighbors throughout the book. It seemed like the author had a clear vision for the book and a voice that was consistent throughout the book, which I can respect and appreciate, especially given that the author's voice and the strength that it gave the book made me feel like I had an opportunity to better understand a culture that I'm not so familiar with. T I received this book in a Goodreads giveaway. Things I liked: the Arabic glossary in the back and the dynamics and interactions between the neighbors throughout the book. It seemed like the author had a clear vision for the book and a voice that was consistent throughout the book, which I can respect and appreciate, especially given that the author's voice and the strength that it gave the book made me feel like I had an opportunity to better understand a culture that I'm not so familiar with. The story arc of May and Hasan had a few poignant moments that stood out to me. A lovely book about 4 neighborhood families and the struggles that they face behind closed doors. Hend writes beautifully. I could relate to something in each of the characters' lives. I loved how she intertwined faith and family relationships into the story. It was a quick read but satisfying. I highly recommend! I love the title, it's exactly what the book is about. It follows four families who show they have happy comfortable lives but actually they've all got issues. There's a bit of everything in this book, happiness, love, betrayal, illness. The characters are very realistic, they remind me of some people I know. Great read! I truly enjoyed this book. It shows us that every household has its own situations and what you think looks like a perfect family may not be so. The only criticism I have is the ending, it felt abrupt but that could be because I enjoyed it so much I didn't want it to end. Hend was born and raised in the USA. She graduated from Smith College with a major in biology and a minor in religion. Hend is a full-time mother of four, and finds that writing helps in the struggle to keep her sanity.